They are old, but still beautiful. Veteran actresses Helen Mirren, Catherine Deneuve and Sophia Loren have made it to the list of 'World's Top 10 Most Beautiful Women'. Clothing firm Wizard Jeans came up with the rankings after assessing media and photo coverage, attracted by famous women, over the past year. Spanish actress Penelope Cruz, 36, topped the list, while Claudia Schiffer, who turns 40 in August, came second. Actress Kristin Scott Thomas, 49 and Queen Rania of Jordan, 39 grabbed the third and fourth spot respectively. 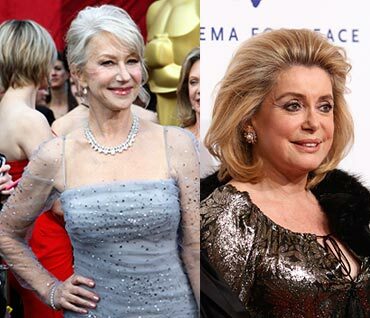 Meanwhile, French star Deneuve, 67, found the fifth spot and Dame Helen Mirren, 65, came sixth. At number 7 is Charlize Theron, 34 followed by Kate Beckinsale, 36 at number 8. Also, Italian Sophia Loren, 76, was in tenth place as the oldest beauty in the league. British actress Natascha McElhone, 40 was placed at number 9. 'As someone once said, the difference between pretty and beautiful is that pretty is temporal, whereas beautiful is eternal,' the Daily Express quoted Sally Allen from the firm, as saying.